A tale of two halves for England as the Three Lions edged a 2-1 victory over Nigeria in their first friendly ahead of the World Cup in Russia. Gareth Southgate lined up his England side with a back three of Cahill, Stones and Walker and operating wingbacks of Tottenham player Kieran Trippier and Manchester United's Ashley Young. The three in midfield were also of Tottenham and Manchester United with Eric Dier, Dele Alli and Jesse Lingard all selected for the friendly at Wembley. Upfront, Harry Kane captained the side alongside Manchester City winger Raheem Sterling who operated as a supporting striker for the time he played. 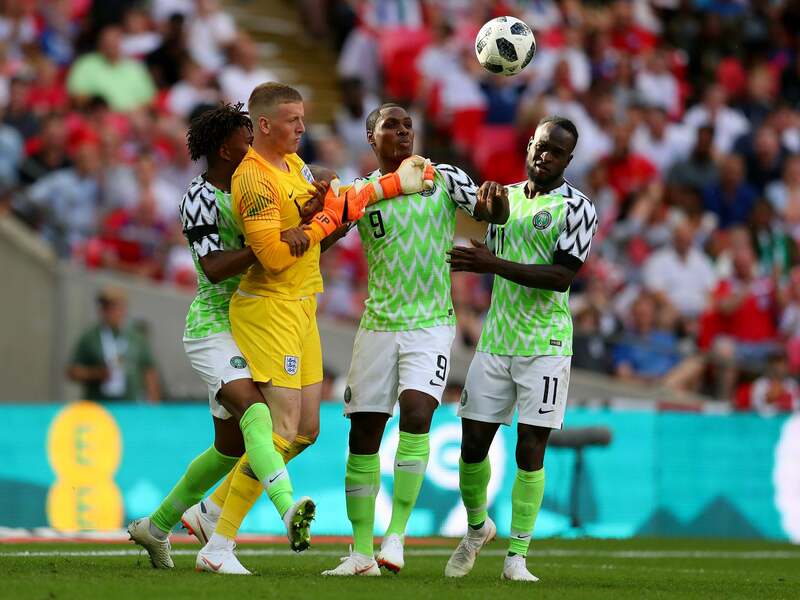 England started positively, stretching the Nigerian back four and after a foul was conceded by the lowest ranked African team at the World Cup, Kieran Trippier and Ashley Young stood over the ball and it was Trippier who took it and gained England their first shot on target and a corner as the Nigerian 'keeper Uzoho palmed his effort wide of the post. Trippier took the subsequent corner and his delightful cross was met by the head of Gary Cahill who blasted the ball into the top corner and scored his first goal in 13 months. England kept pressing for a second goal and looked lively and fresh with good movement from Lingard and Alli. Nigeria had a bit of possession around 25 minutes in but it came to nothing and England dominated the half. The home side doubled their lead just before the forty minute mark and it came from their skipper, Harry Kane who was on the recieving end of a one-two with Raheem Sterling and he fired the shot past Uzoho who could not sort out his hands and it flew past him. Nigeria had a few last minute moments in the first half through Victor Moses but came to nothing and England's 2-0 lead looked impressive and promising for a thumping result. Nigeria made four changes at the start of the second half and swapped to a back five with a man marking system in place. They started very positively and scored after two minutes after Ighalo's stunning shot cracked against the post and Arsenal's Alex Iwobi cooly drove his shot past Jordan Pickford to liven up the game. England tried to get their two goal lead back but to no avail as Raheem Sterling raced into the box and went down, but the referee correctly deemed the former Liverpool winger to have dived and booked him for simulation. Quite a foolish decision from Sterling as he did not need to dive and could have either earned England a penalty from a genuine foul or teeing up one of his teammates. England and Nigeria both made many changes but the result did not change and the game ended 2-1. Not the best second half and something for England's opposition to look at. Was not troubled at all, a solid performance from the Everton 'keeper and could do nothing about the goal. Assisted the first goal and was a threat throughout the game and offered width like any good fullback should. He is likely to keep his place for the World Cup group stages provided he stays fit. A few nervy moments, but made up for them. He has adapted well under this system and despite not earning the minutes for Man City in the latter stages of the season, is almost guaranteed to start at the World Cup. He may not have played today had Harry Maguire not missed training through a niggling injury, but Cahill did very well today. A thumping header opened the scoring and he was very solid and composed at the back and a good leader for Stones to learn from. Food for thought Gareth? Decent performance from Young, had a chance to double England's lead early on but took to long and it was blocked. A couple of decent deliveries but nothing that challenged the Nigerian defence. Decent performance as well. Did not do much wrong but should have scored with a glancing header which to be fair, only narrowly missed the target. Would generally prefer Henderson over Dier in that role as Dier is more defensive and Henderson can play the ball better and would suit the formation with his ability to switch the play. There were good parts and there were bad parts to Dele's performance. While he did make good movements off the ball, some of his play was perhaps a bit lax and sluggish. A few times he got into good positions and then wasted the chances with poor passes and bad judgement. The booing from the Nigerian side in the first half could not have helped. Marginally better than Alli. Was lively and made good runs but had no real end product. He will need to show his worth against Costa Rica or he may be forced to being a sub for the World Cup. While there were some poor choices today from Raheem, he was electrifying at times and troubled the Nigerian defence with some good play, he teed up Kane for the second goal and was unlucky not to score himself a couple of times. He does need to get rid of the diving as it could cost England in the World Cup with a potential suspension from a crucial game. Lead by example. Scored a lucky goal which you would expect any goalkeeper in the top flight to save but a goal is a goal. He linked up well with the team but should try to get in the box instead of always coming short and trust the likes of Alli and Lingard in letting them play in the midfield and work the ball to him. This is what cost him some confidence at the Euros and he needs to stop it. Looked lively and energetic. Decent chances created by the youngster and could start against Costa Rica. Did nothing wrong but perhaps lacking match fitness? Lively but had no end product. Will hope to build his confidence up after the diffucult FA Cup defeat. Lively as well. Tried to linkup at times with Rashford but once again, no end product. Decent for the time he was on. Played a lot deeper than he did for Villa or even when he was played in the midfield by Pellegrini. Could be an interesting asset for England.